For the purposes of this website, I use the term Prawns and Shrimps to mean the same thing; they are just termed differently in the US and in the UK. Patak’s original mild curry paste (optional) – found in most regular grocery stores, esp. the desi ones. Spices: 2 heaped tsp of Coriander powder, 1 tsp of Turmeric, 1/2 tsp of chilli powder (or more if you like it hot and spicy), 1 and 1/2 tsp of Paprika, 1 and 1/2 tsp of Cumin, and 1 tsp salt. 1. If you are using prawns that have the shell on, prepare them by removing the shell, the head and the tail. Wash clean and drain. 2. Dice the onion and the garlic and keep separate. 4. Add chopped garlic to hot oil and fry for 2 minutes. 5. When the garlic starts to turn brown, add the diced onion and green chillies. 9. Simmer for 5 minutes then add sliced green pepper. Simmer for a further 5-6 minutes. 10. Add the mushrooms and stir well for 2-3 minutes. 11. 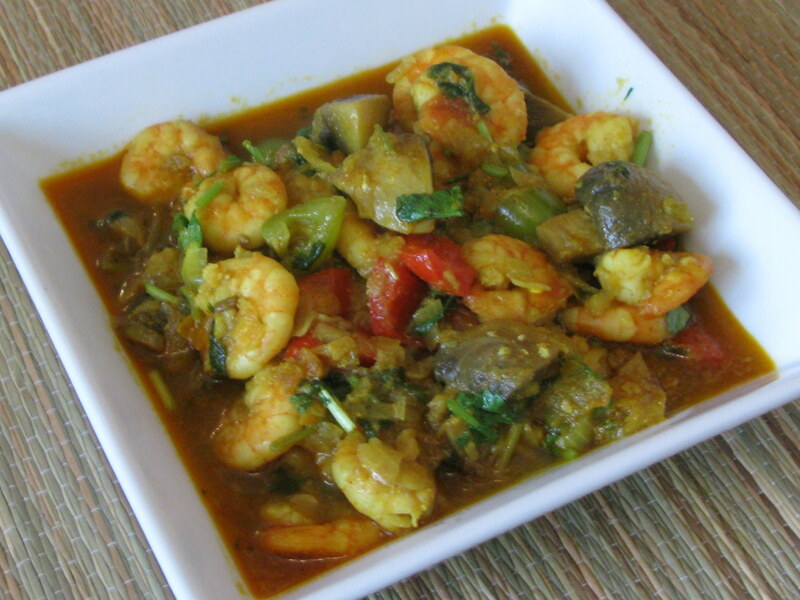 Optional – stir in 1 teaspoon of Patak’s Original Mild Curry Paste and simmer for 3 minutes before removing from heat. This has a touch of lime in it and really enhances the flavour and colour of the dish! Recommendations: Best eaten with plain white basmati rice, coconut rice or brown rice.